We have recently moved into an old brick building (ca. 1905) that is falling down. The very long list of repairs includes repointing all the lime mortar between the bricks which has weathered out over time. I also want to install a bee hotel (or B&B) somewhere in the garden. I have had several half-hearted attempts at this elsewhere but now it’s time to get serious. My guru on bees and other things pollinating is Karen Retra, based in Albury. One of her many jobs is to coordinate the Wild Pollinator Count, a citizen science project run twice a year. 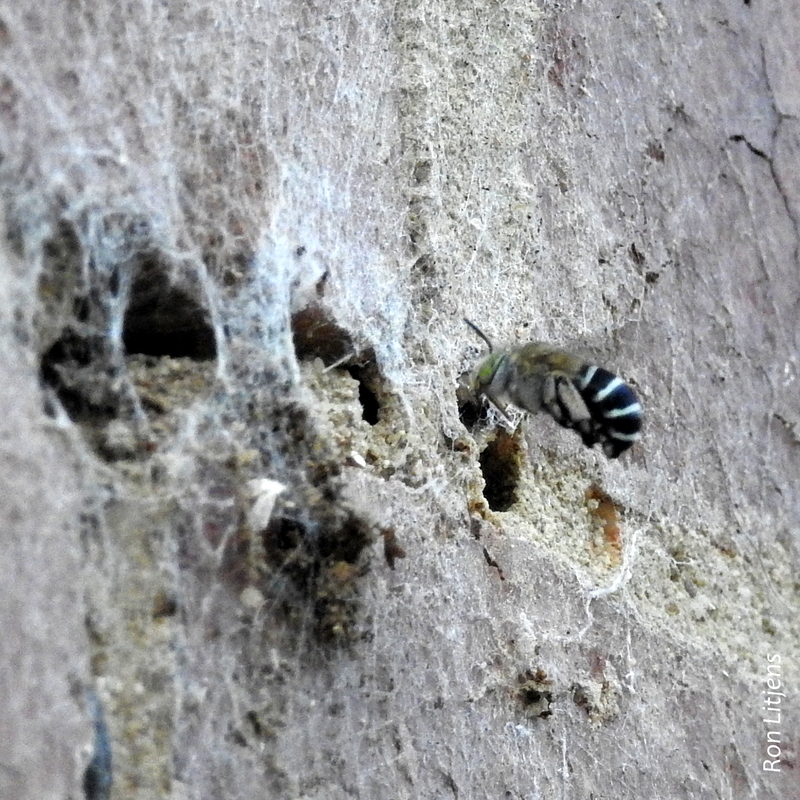 Karen’s website contains some really great downloadable resources including how to build bee (& other critter) hotels. 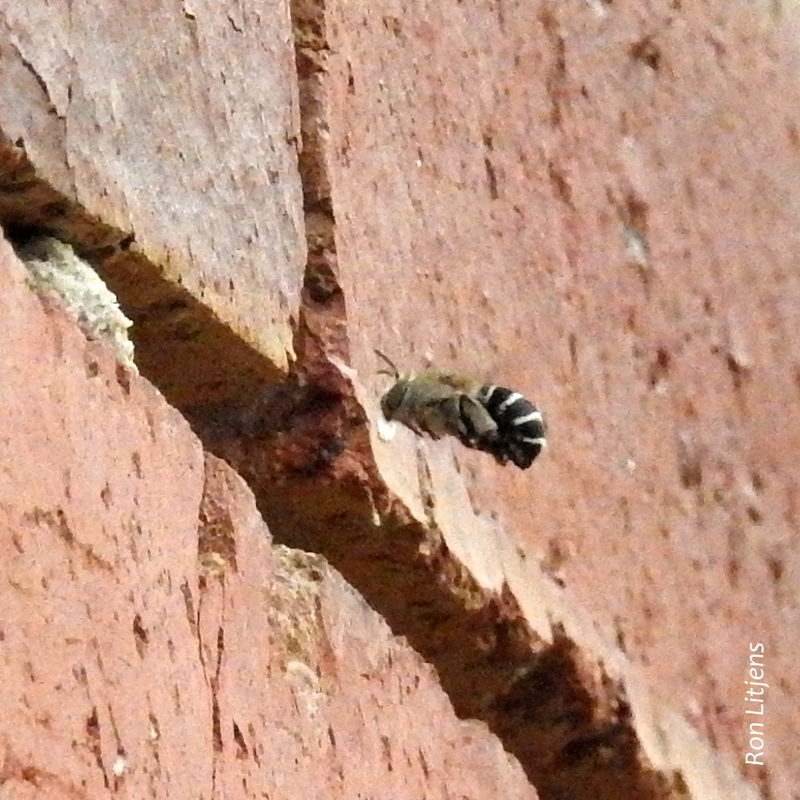 Walking next to the building last night after a very hot day I heard the buzzing sound I recognized to be that of Blue-banded Bees (Amegilla sp.) (who’s calling me a nerd?). Looking up I saw not one or two but dozens of these bees coming back to their nesting sites in the weathered mortar (photos above and right). Blue-banded Bees, covered previously on this blog-site, are native to Australia. They build solitary nests burrowed into limestone, dried river banks and, surprise, surprise, mortar between bricks. At the end of the tunnel is a cell which contains a single egg. I’m now in a dilemma. 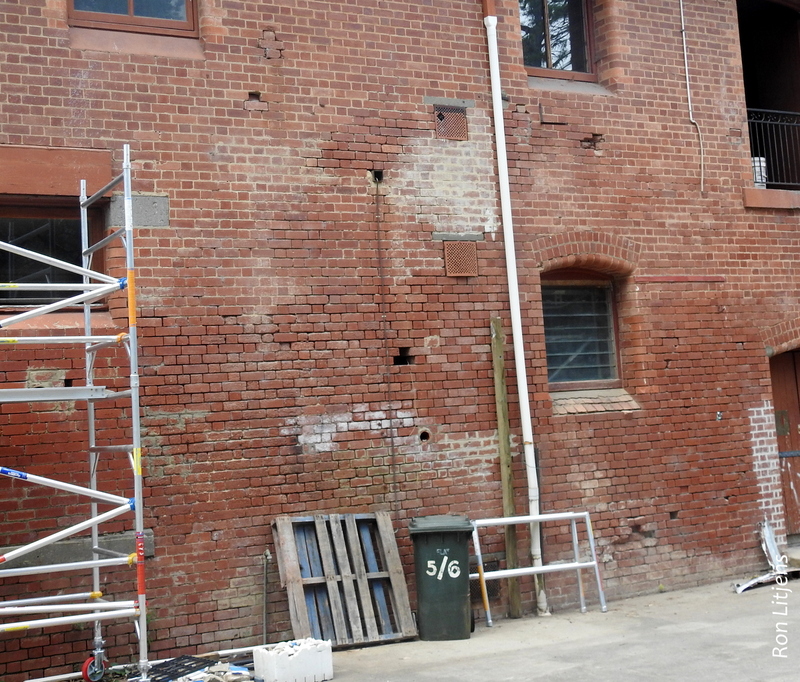 I have just purchased scaffolding so that I can access the upper reaches of the brick wall to repoint all the cracks and holes in the mortar (see picture left). Currently the scaffolding has temporarily been transformed into a viewing platform of my newly discovered residents but I will eventually have to renovate the building … or maybe not? I now find myself living in the largest bee hotel in the world. I wonder how much of the mortar damage the little buggers did themselves! Thanks for the shout out, Ron! I’m no guru … just a bit obsessed with watching for nature’s wonders, and the insects really impress! A very exiting find and I’m sure it will keep you entertained to observe the comings and goings … watch out, it’s addictive!